Previews begin March 4, 2017. Opened March 26th, 2017. Production ran through June 25th, 2017. 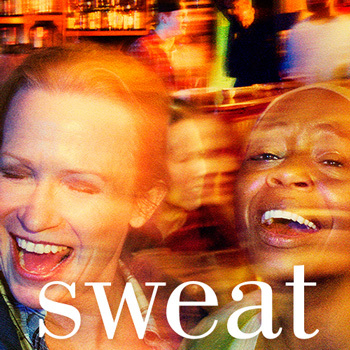 SWEAT, the critically acclaimed new play from Pulitzer Prize-winning writer Lynn Nottage, comes to Broadway following its sold-out run at The Public Theater. Charles Isherwood of The New York Times hails it as a "scorching, superb and vital contribution to contemporary drama." Kate Whoriskey's "assured and emotionally vibrant staging" (David Cote, Time Out New York) illuminates this "perfectly written" (Hilton Als, The New Yorker) play about the collision of race, class and friendship in a Rust Belt town at a pivotal moment in America. Filled with warm humor and tremendous heart, SWEAT tells the story of a group of friends who have spent their lives sharing drinks, secrets and laughs while working together on the factory floor. But when layoffs and picket lines begin to chip away at their trust, the friends find themselves pitted against each other in a heart-wrenching fight to stay afloat. Don't miss this groundbreaking new drama from Lynn Nottage ("as fine a playwright as America has" — Terry Teachout, The Wall Street Journal) that "goes where few playwrights have dared to go" (Marilyn Stasio, Variety).